Looking for apartments for rent in Colorado because you love to ski? The problem with going skiing when you live in Colorado is that most of the resorts are 100+ miles from most of the population. It’s not like living in Utah where precious powder is just a hop, skip, and jump from all the major cities. Here’s a list of ski resorts and cities in Colorado that are actually near each other as well as average apartment rental rates for each city. 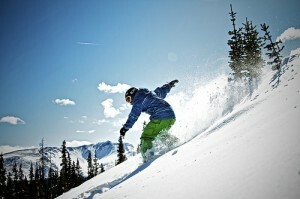 Eldora Mountain Resort is only 21.5 miles from Boulder, CO and has both short lines and short runs. Depending on the weather, plan on about 45 minutes to drive from downtown Boulder to the resort, or catch a ski and ride bus which departs five times each day during the winter. The trails range from beginner to advanced and about 50% of them fall right in the middle at an intermediate level. Boulder is about 30 miles north of Denver and an average apartment for rent here is $989 per month. Powderhorn Resort is in the western part of Colorado, 33.5 miles from Clifton, CO (a suburb of Grand Junction). The staff here is friendly and the resort has a home-town feel with no lines at the lifts, which are fairly slow. Plan for about a 45 minute drive to get to Powderhorn and plan to pay average rent of $738 per month for an apartment in Clifton — a great deal for this small town of around 18,000 residents. Echo Mountain Park is 31.9 miles from Lakewood, CO and attracts locals from the entire Denver area. It was built specifically to cater to a younger crowd and draws in plenty of snowboarders. Lines here are heavy on the weekends, but tolerable during the week. The terrain is diverse and there’s great tree skiing. Lakewood is a western suburb of Denver with apartments renting for an average of $788 per month. Everybody knows that Colorado is a great place to live and an even better place to ski, but most people associate winter sports here as occurring deep in the mountains at fancy resorts like and Aspen. The locals, however, don’t have time to drive for hours just to ski for an afternoon, so they’ve found great secret resorts like those listed here and they live as close to them as possible so they can get up the mountain at every opportunity. Happy hunting for an apartment near a ski resort in Colorado for rent! How about you? Any luck finding Apartments in Colorado for Rent near skiing? Comment below.